From time to time, your tenant may be late with a rent payment. A late rent notice should only contain facts. It should never contain any negative comments about your tenant. Although it can be frustrating to receive late rent payments, especially when it is happening month after month, there are things you should do and things you should not do. Collecting late rent is without a doubt, a time consuming tedious process. And, sending out a late rent notice requires extra time to do it right. Although this may be true, it is important for you to enforce late fees, and stick to your rules! That is, if your lease agreement has a stipulation on how you will handle late payments. The reality is, some tenants just don’t seem organized enough, or just don’t have enough money on hand, to make their payments on time. And, despite promising to pay rent by a certain date, there will be that one tenant that never follows through. What are your the best options when it comes to tenants who never pay their rent on time? The lease agreement is your most important tool in preventing late rent payments. Provisions you should consider using in your lease agreement should encourage timely payments, and discourage late payments. That said, you should always check with your attorney before you make any changes to your rental agreement. When the the rent is late, it is advisable to send a late rent notice immediately! Late rent payments are to be expected in the rental business. However, if you anticipate them in your lease agreements, you have the ability to encourage timely payments and discourage late payments. Moreover, you may even be able to terminate a tenant’s lease if they habitually pay their rent late. Again, you should always check with your attorney upon termination. Rent is legally due on the date specified in your lease or rental agreement. If your tenant does not pay rent when it is due, you as the landlord can begin charging a late fee. 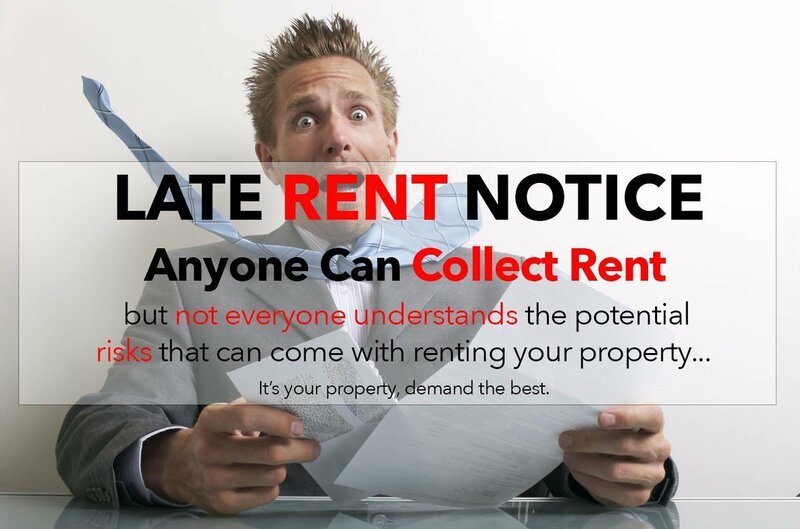 Your tenant must understand, there are consequences of paying rent late. This includes late fees and termination of the tenancy. However, make sure you follow the procedure, and document every step of the process. This will help to ensure you are only doing what you are allowed to do. It is a fact that late rent erodes trust between you and your tenant. It leaves you wondering what else your tenant is not taking care of in your rental property. Naturally it will also make you question their ability to pay rent the next month. Because if someone is not responsible enough to pay their rent on time, it is highly likely they are not responsible enough to take care of your property. One of the best ways to avoid late rental payments is by screening your tenants thoroughly. This will help to estimate their level of responsibility and their ability to pay their rent. We recommend taking time to ensure your tenant screening process is thorough. By putting time and effort into your tenant screening process, you reduce your risk of renting to those who are not capable of paying rent on time. Qualities to look for in a tenant include a solid credit score and a well paying, stable job situation among other things. One simple way to avoid late payments is to collect rent online. Did you know that you, as a client of Rancho Mesa Properties your tenants can pay their rent and even submit maintenance requests online! It’s fast, easy, and secure. Below, you’ll find some information on the benefits of our online portal. It is a fact that tenants sometimes don’t pay rent on time. In fact, they may only turn in a partial payment, or worse case scenario, they refuse to pay rent. In order to avoid rent disputes, we strongly recommend you consider the terms in your lease agreement. Another way to avoid late rent payments is by improving your tenant screening process. If you thoroughly screen a tenant before signing a lease with them, including contacting previous landlords and verifying their employment, then you increase your chances of them being able to pay you. Although some landlords tend to show some leniency for tenants with one or more late payments, eventually the problem will get worse. The reality is, cutting them even a little bit of slack regarding on-time, in-full payments can lead to late payments becoming a trend. That’s why it is best to avoid doing so. If the problem persists, you may need to start the eviction process. Have you ever dealt with late rental payments? Hire a property management company to do the work for you. Deciding to utilize a property management company can take a lot of the stress out of owning a rental property. By finding a full service company that is willing to go above and beyond to ensure your satisfaction and that of your tenants, you will find more freedom. Whether you are interested in changing property managers, or simply looking to hire a property management company for the first time, Rancho Mesa Properties can help. We take care of all types of residential rental properties including homes, condos, multiplexes such as duplex and triplexes, and even small apartment buildings. Let us manage your rental properties, so you can enjoy your life! Call us today at (858) 576-2176. We will save you time, money, and the stress that comes along with managing your own rentals.